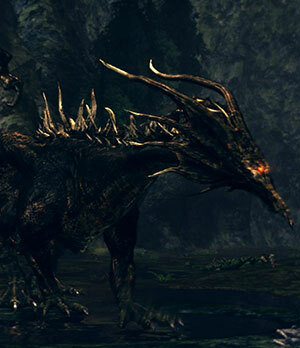 The red nosed Black Dragon Kalameet is one of the last remaining ancient dragons. To honor your services to Artorias, Gough incapacitates the dragon with his greatbow, allowing you to fight Kalameet more easily. Kalameet can first be seen when about to cross the stone bridge leading to the second area of Royal Wood. After the cutscene, a fog gate will appear in front of Kalameet's boss area. You can now properly fight Kalameet. Royal Wood (including Artorias's boss area) is now eligible for summoning/invading again as Kalameet is now considered a boss for the area. From Chester's spot, cross the short stone bridge, then turn left. Just go straight forward after the slope. His area is behind the third dog. A Titanite Slab can be obtained from the chest behind the waterfall either after Kalameet is defeated or even before, if you're fast enough. A Crystal Lizard can be found over the edge of the waterfall resting on a ledge. Despite being a dragon, Kalameet has extremely high resistance to lightning. His black fire breath attacks cause a large drain on stamina and deals both physical and magic damage. Avoid it wherever possible. Vertical breath blast - Flies up and breathes fire straight down which spreads across the ground in all directions. Forward breath blast - Breathes fire straight forward in a line with long range. Arcing breath blast - Retracts head with black flame appearing around mouth while turning to the left, then breathes fire across an arc of about sixty degrees. Forward charge - Leaps forward for a moderate distance then turns around while breathing fire in an arc in the direction he came from. Sit up breath blast - Sits up on back legs and then blasts breath on the ground in front of him. Telekinesis - Sits up on back legs and then emits a telekinetic field in front of him, grabbing anyone caught in it and causing damage. The affected character will take double damage for a short time, indicated by an eye icon floating above their head (see Calamity Ring). Head swipe - Swipes his head for moderate damage. May follow up with a swipe in the other direction. Lunging head swipe - Similar to the above attack but with deceptive range. He will not follow this attack up but it is more powerful, and will knock you back even if blocked. Diving attack - Hovers above the ground, then does a dive attack. Tail pound - Player must be directly behind Kalameet and under his tail, slams his tail into the ground for massive damage in a small area. This attack leaves Kalameet's tail exposed, use this opportunity to cut his tail. Easiest to bait out after a diving attack. 360 degrees tail swipe - Sweeps tail in a complete circle. Foot stomp - Stomps with left front leg and then right back leg or vice versa. Regardless of strategy, do not stand directly in front of him. Always be circling around him, preferably clockwise (to your left) so that he is facing slightly off to your side. This will allow you to completely avoid his lethal charge attack and linear breath attack, both of which he can do without warning, and you can more easily dodge his sit-up attacks. Dodging all his attacks requires practice and a lot of deaths. Under 25% encumbrance is a requirement and stamina recovery (eg Grass Crest Shield) is highly recommended. Familiarise yourself with all his moves, his head swipes should be rolled through, roll to the left of his dive attack, run to the left of any of his breath attacks except his vertical breath attack, which you should run away from. Unless going for his tail cut he will likely not use his tail slam but to avoid it if he does, roll to the side. Similarly with his foot stomp, but just roll back. Do not use lock-on for this strategy. Blocking his attacks is simpler but requires much better equipment. A heavy shield with high stability, such as the Greatshield of Artorias, is necessary. Try to avoid his fire attacks where you can and do not get hit by his telekinesis. If you see him sitting up at all, run or roll to his side. Note that high poise can be a hazard as you will be hit multiple times by lunge attacks that would otherwise just knock you down, but high defence and magic resistance is desirable. Using lock-on will help you point your shield in the right direction however be wary of his flying vertical breath attack as it can point the camera into the air and make it difficult to get away from. Note you will need to unlock to get any attacks in if using melee. If you get hit by his Telekinesis it is more important than ever to dodge all his attacks as you will take double damage. Play super-safe until the effect wears off. Kalameet is fast and hits hard, kindling the Oolacile Township bonfire three times is highly recommended to reduce the risk of running out of Estus. The easiest window for attack is when he lowers his head for either his straight breath attack or his arcing breath attack. You can simply run to the left and hit his neck until he finishes. If you are close enough to you you can also get some attacks in as he sits back for either a breath attack or his telekinesis by running around to his side. If he uses his foot stomp you can usually get an attack or two in, wait until safe. If dodging you should two-hand your weapon for more damage, there is no point trying to block without proper equipment. You can additionally get attacks in after his double head swipe (very small window) and dive attack (beware of tail attacks). As always keep an eye on your stamina and leave enough to respond to his next attack. Do not get caught up against a wall and be wary of the cliff at the end of the canyon. Be aware of where you are on the map and circle around him to give yourself the most room. Climbing the ladder after engaging him will cause him to fly up and cover the area in fire, likely killing you instantly. The maximum lock-on range slightly exceeds the range of Kalameet's breath attacks. This allows you to stay just out of range and shoot projectiles at him while locked on. Fighting from a distance eliminates most of the dragon's nastiest attacks. He will rely primarily on breath attacks, which are easily avoided from far away. Each time he uses his breath, you should be able to get one or two shots in. Watch for his lunging head attack, it deals massive damage and has a deceptively long range. Roll back or through it when you see him preparing for it. 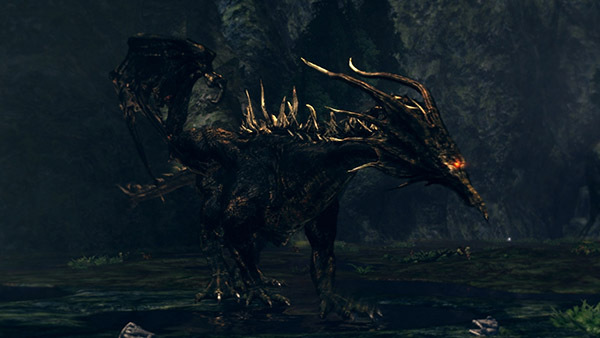 In case of Kalameet, the tail has about 10% of Kalameet's HP. The tail pound is the greatest opportunity for getting hits on his tail, roll to the left when he does a dive attack and then bait out his tail slam to get a few hits in. It can also be provoked by rolling forward through or blocking a head swipe and running to his rear, but this is difficult to pull off. His dive attack is more easily baited out by equipping the Ring of Fog. Melee - Only a few hits with a decent weapon such as a Black Knight Sword should be necessary but the windows are difficult to find. Be sure to two-hand your weapon for additional damage. If you are close enough when he does his sit-up breath attack you can get extra hits in by running around and doing a running attack. A weapon that performs an overhead swing with this attack is preferable. Circling to his right (your left) may cause him to do this less often but will leave you in a better position when he does. A spear or halberd can be utilized after a Kalameet's tail pound to make up for some of the distance that would otherwise be spent running towards the tail. Pyromancy - Strong Pyromancy can be used to "cut" his tail off if you lack a good weapon. Ascended Pyromancy Flame +5 is highly recommended. Great Chaos Fireball is particularly effective after a tail slam as it leaves a lava patch on the ground that will deal additional damage. You will need to time it to hit as his tail hits the ground for maximum effectiveness. Sorcery - There are several good sorceries that will allow you to "cut" his tail with an Intelligence build, Bellowing Dragoncrest Ring and Crown of Dusk / Crown of the Dark Sun recommended. You will nearly always need to bait out a tail pound for this method. A good hit from Dark Bead can sever the tail in one cast. Any strong sorcery you can "aim" will be sufficient, such as Crystal Soul Spear. Be prepared to spend up to an hour and several hundred arrows doing this, as the damage inflicted at that range will not be great. Defeating Kalameet without the aid of Hawkeye Gough is tedious, but not particularly difficult. Characters with a fully upgraded bow, as well as a high stamina/equip load/Dexterity, will find it easier. First, tank up. Hawk Ring and Havel's gear/shield is recommended. Upgrade your strongest bow - Dragonslayer's is best - and stock up on Estus, Green Blossom and Humanity, as you will need to heal regularly and keep your stamina bar full. After sliding down the ladder,dash to the large waterfall in Kalameet's arena, standing against the wall with your back to the right-hand side of the Titanite Slab chest. This will prevent you from being pushed back by his breath attack. Aiming at the canyon entrance where he flies in, you will see a row of trees on the right-hand side. Zoom in and position your reticle just above the tip of the shortest tree (furthest to the left) and release the arrow just as he unleashes his breath attack. This will give you a higher chance of scoring a headshot. Once the arrow is released, raise your shield to protect against his breath attack. It should only hit you once, but will do some health/stamina damage. When he flies off, he will not return for 15-20 seconds, allowing you to heal/consume Green Blossom etc. Rinse and repeat.